« What’s Happening On Vermont? Yeah, I’ve met the President, and seen Barack Obama and Bill Clinton do speeches (as candidates only), but I’ve never seen any sitting President of the United States – do a speech. 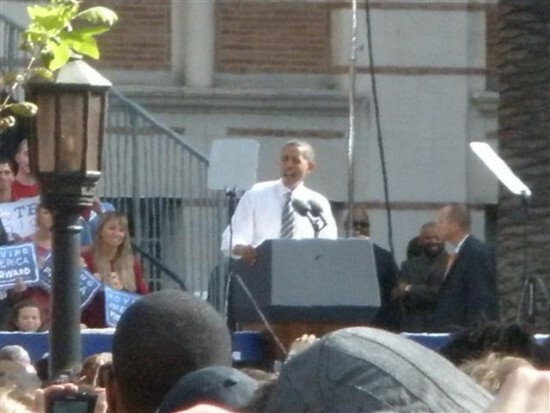 And how often does the POTUS get to speak at my alma mater? 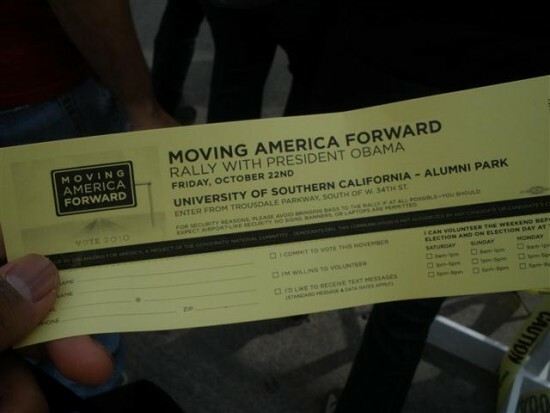 I had to go down to USC on Friday and see The Prez speak. The event was a very pro-Democratic Party event, called “Moving America Forward,” meant to energize voter participation in the upcoming November midterm elections, especially to rally for Senator Barbara Boxer’s and gubernatorial candidate Jerry Brown’s campaigns to Fight On. Yes, today was definitely not a good day to be a UCLA Republican. I knew traffic was gonna be nuts, so I rode the Metro Red Line to 7th Street/Metro Center in Downtown L.A. and biked the rest of the way to USC, riding mostly along the path of the under-construction Exposition Light Rail Line. When I got there, traffic was pretty much nonexistent, but I could already spot throngs of people queuing up for the event. I had arrived at about 10:30 a.m., locked my bike on a City streetlight on Jefferson Blvd (as it appeared campus bike racks were verboten for the day), and walked to find the end of the line. So I walked. And walked. The end of the 1.5-mile line. I finally discovered the end of the line at Vermont Ave. at 37th Place, doubting whether I would be able to get in to the event at Alumni Park, a section of campus that fronts the Doheny Library, where our graduation ceremonies are held each May. 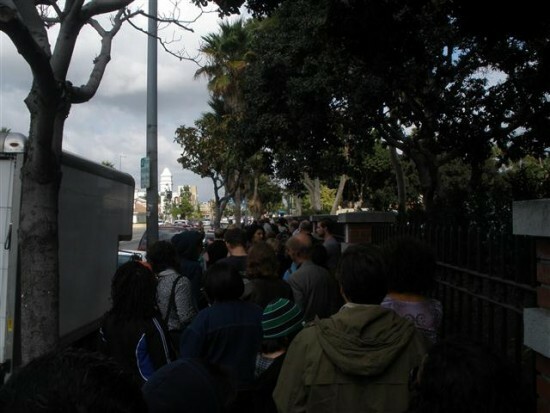 The endless line of people indicated to me that perhaps the President should have spoken at the nearby L.A. Memorial Coliseum instead. 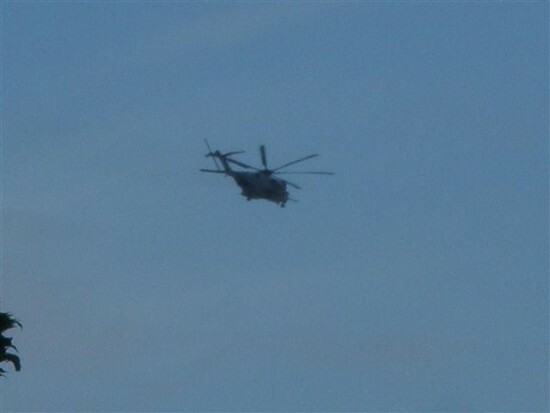 I stood in line with several others, and the sight of the military helicopters carrying staff and press, and finally Marine One carrying the President, flew overhead. It landed at the Coliseum’s parking lot where the world’s shortest motorcade route took him across the street to campus. The line started to move, then stop. Then move, then stop. Then move for quite a distance, then stop, then move again. I touched base with my friend Filiberto over the phone, who brought his two preschool-aged daughters to the event, but went to another part of campus to avoid the line. He did see the president and his entourage pass by, but instead stayed outside the security perimeter outside the Annenberg School of Communication and Journalism (alumni represent!) building. I was debating whether to leave the line and join him, but decided to Hope for my luck to Change and get in. 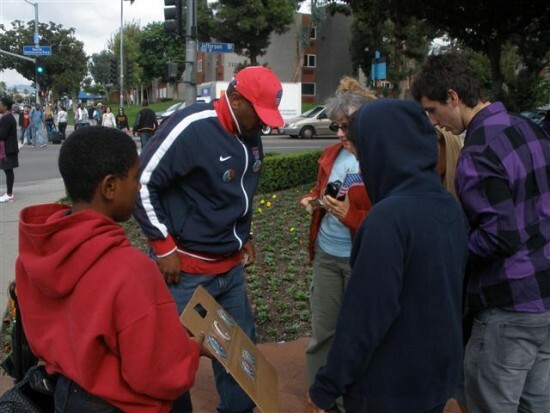 In the event I was turned away, I would head over to the Annenberg site. Buttons for Sale: Why do some people say Obama is a "Socialist" when he brings out some very capitalist activity? After entering campus, the line snaked even further west on 34th Street, then horseshoed back. But finally, I was in. Not allowed: Umbrellas, bottles, food, signs, banners. 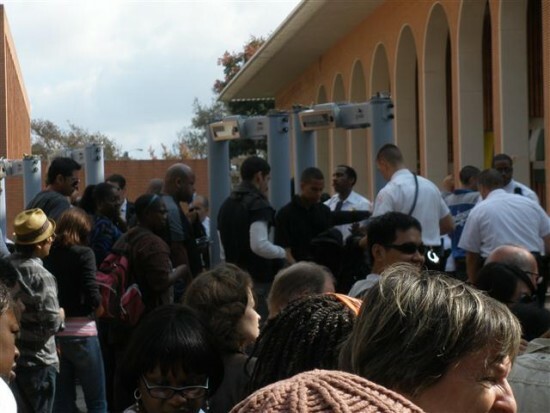 There were lanes of metal detectors, and items like food and umbrellas were prohibited. 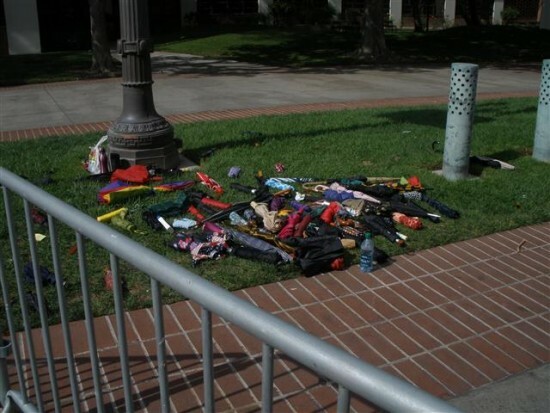 A pile of the aforementioned items lay right outside the metal detector lanes. I finally got in just after 1:30 p.m., and the L.A.’s own Ozomatli played live. There was surprisingly more available space than I thought, although I couldn’t see the band at all. 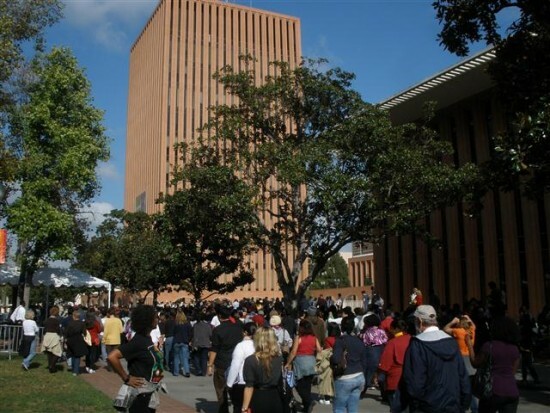 I saw the crowd in front of the Annenberg building where my friend was at, but that was probably twice as far from the stage as where I was. I stood in a spot just feet away from my seat at the USC Commencement Ceremony in 1995. The grass was still damp from the recent rains, and likewise its smell pervaded the entire area. Over 200 feet of humanity and a forest of outstretched arms holding digital cameras stood between me and the stage area, which stood a background audience of mostly cardinal-wearing USC students. However, a tree stood directly in my line of sight from the podium, so I had to carefully navigate a bit to my right in order to clear it. Entertainer Jamie Foxx hosted the event, and brought out politicos like U.S. Secretary of Labor Hilda Solis, Attorney General candidate Kamala Harris, Jerry Brown, Barbara Boxer and finally President Obama. Once the president came out, visibility was further impaired by even more outstretched arms holding cameras and phones, and as if on cue, about a dozen children placed on top of their parent’s shoulders. Great. But as long as I was able to take a few pics (with the grateful technological assistance of digital zoom), I was happy. I mean, I shook hands with the guy a couple months ago, so as long as I got to hear the speech and see a bit of it, that was good enough for me. As mentioned, this was a decidedly partisan event, and all of the speeches were rallying either Democrats to continue to vote the party line, or vote Democratic. Interestingly, none of the speakers used the term. “Republican” but rather the phrase, “The Other Side.” It wasn’t one of those grand, awe-inspiring speeches aimed at all Americans, such as his nomination speech, his treatise on race in America or even his inaugural speech. But then again, those were meant for momentous occasions. One can only guess that the use of car euphemisms in the speech (i.e. the previous administration driving the metaphorical car into a ditch; putting a car in “D” to go forward, “R” to go backwards) were picked for the Los Angeles crowd. But hey, I got to hear the President of the United States do a speech! I’ve already lived through the terms of seven presidents and only got this opportunity today. And because I never had the opportunity to in ’08, I joined in a “Yes we can!” chant (the one Obama campaign speech I attended was still a year before the chant became a campaign slogan). At the end of the 20-minute speech, the crowd quickly dissipated. To me it looked like graduation day times 500. But it was actually some 37,500 — roughly twice the attendance of a Lakers game at Staples Center. The crowd files past VKC and Waite Philips Hall. Marine One heads to Burbank Airport, where a second motorcade will take him to a radio station appearance in downtown Glendale. As I returned to unlock my bike, an elderly woman who recognized me from the line (who came all the way from San Diego) asked me how to get to the “University Parking Structure.” I replied, “Which one?” I then realized it was the former Broadway warehouse across the 110 freeway and quipped, “That wasn’t around when I was going to school here!” Looks like I was the old timer here. I told them they could just walk down Jefferson under the freeway to get there. I obviously didn’t get to do motorcade duty this time around, but a friend of mine got the opportunity. He drove the President from Burbank Airport to Glendale and back in a second motorcade. 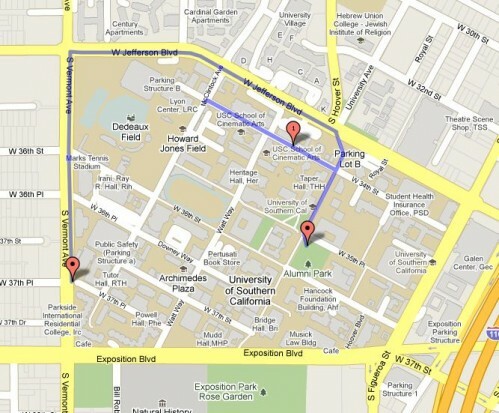 Apparently there was such an uproar over the traffic snarls from his August visit that this arrangement was worked out. It may be that the crosstown motorcade I got to drive in might be the last of its kind. My friend unfortunately didn’t get to meet Obama and quipped that I still got to see the president more than he did today. View these pics on Flickr! Thanks for sharing about your time. I was hoping to go but missed it, so it is nice to read your personal update on this. Peace. (On the other hand, It’s yet to land me a career in writing…but that’s…another story…Grrr…). Thanks! Great story…although, after seeing the line you stood in and the size of the crowd, I made the correct decision in not going. I would have had to use a vacation day, and I would have been disappointed that I wasn’t in the front row!